Well, I did get the old source built. Includes the launcher, masterlist, server, and client. Plus a few more small fixes. 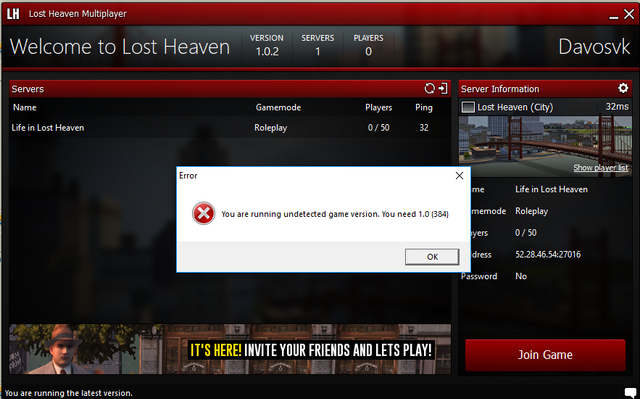 Does server browser cannot working if master server will be down like in previuos version of lhmp? I got the master list up and running temporarily. Are you planning MP with the cars and guns like deathmatch mod? I'm a little bit confusing, It's old MP not new coop MP, right? And I cannot run the client on my notebook, after I have specified a path to mafia folder and clicked choose this folder nothing happened On my table PC everything works fine. Any software requirements for the client? Yes, this is the old MP, from the old website lh-mp.eu. The source is on GitHub. I got a temporary version online so people could play multiplayer for Mafia 1 while DavoSK works on his new version. No software requirements specifically, but you will need a 1.0 patch. Does your notebook run Mafia 1 in singleplayer? Does your notebook run Mafia 1 in singleplayer? Yes, I can do It, but I mean server browser, after I have specified game path nothing happend, but I expect server browser window of course. I also try to copy mafia folder to program files folder, but no result. You're more than welcome to host your own server. for example than I can load any mission, but how I can know coords to prevent wrong player's position?! Can I do it by MWE ?! So If I understand right we can make custom DM maps by MWE for example and LHMP will be working there correctly, It's amazing opportunity. Wishful thinking this will be out soon like he says, but we'll see, this makes the MMP mod put on hold for now, well who can blame him it's immense amounts of work, with no payoff. But this looks awesome as it is, reminded me of @Jakubek videos. Keep holding the MAFIA banner high. One of the players host the server, where the second player connects to a remote session, receives audio and video from the server, while he is sending his input to the server. Server then replicates the input for the second player, while rendering the viewport for him. This is especially great for LAN parties or local co-op, where bandwidth is not big of an issue. Note that this is not MMP, but a separate project to provide local co-op experience for the players, so they can play the missions together or drive around in free ride. Take it as game share service, where the second player connects to the screen of the first player and controls his own character, but in this case, it's actually far more advanced and Mafia specific. Hm, If I understood right we also can play different mission mods by this way?! If both players has this mod installed? The second player does not need to have the game installed, since he is playing via browser client (as DavoSK has mentioned in his YouTube video description). As for mods, I am not sure about mod possibilities, you better ask DavoSK about this. Thank you, it works now. First I've got an Error that LS3D0.dll is missing. So I copied LS3DF.dll, and then renamed it to LS3D0.dll, and now everything works. But in the city, there are not any people/traffic/trams/metros. and no guns, so its empty as hell. Is there way to start server with traffic/wepons/anything ? if not, I'm going to try add some enemies in to freeride or even which map is loader.exe starting ?? You can create your own server and join to It! If you have extern ip your server will have been connect to the master server than we can see your server globaly and connect to you, than we will be have DM mode. Everything is simple.